No food post for today as I was little busy the whole yesterday doing nothing...Hahaha! Well, I cooked for both lunch and dinner...that's a lot of work already right! I recently celebrated my 31st Birthday, on 7th Nov. A prezzie from beloved Hubby is a must...owh, I'm so mean!!! Panasonic Lumix FH20, a pocket digital camera this time. A gift which I can keep in my bag and walk around, get some candid shots. I'm beginning to like the camera, pics are good especially outdoor ones. Can't be carrying our Canon dslr bag everywhere. That's mainly to shoot food pics and hubby's marine aquarium. Also for vacations and functions. Newayz, I love both the cameras!!! Thanks my dear Hubby, in Cape Town right now...missed U Chelo!!! Next, I received an award! 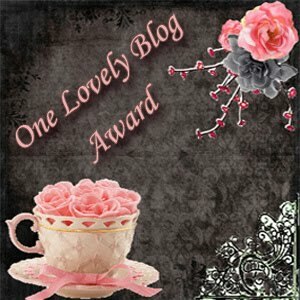 Ms. Biren@RotinRice and Ms.Ruby@punjabifooddiary passed me One Lovely Blog Award. I should first apologize for posting the award little late here. I'm suffering from a short term memory loss lately...hehehe! Luckily I browsed through my folders and found my pending homework. I'm honoured to see my blog listed in their 15! Thank you so much to the beautiful ladies. I'd like to pass on the award not to just 15 friends of mine...but to everyone I knew through blogworld! Fair??? Don't worry, I'll message U whenever I'm at your site...deal! Alright gotto go...see ya'll next time! Hi Love..lamanya k.atie x zoarah Love..bz sikit.Wah! 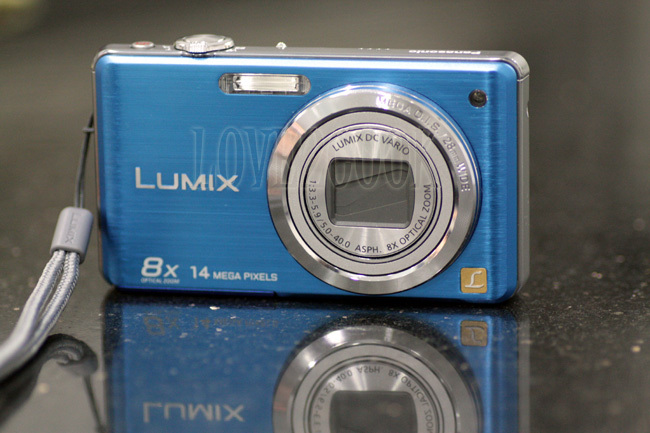 !brtuahnya dpt hadiah dr HB...blueeee kamera !!!! Wow, that's a very nice b'day gift!! I know Pan.Lumix is really a good camera coz my hub owns a DMC-TZ7 and i must say that the night scene is one of the best I've seen...the pics are not "yellowish" even if you take them in the "night mode". Have fun with that cam! Wow lovely gift frm beloved hubby...enjoy ur life dear. Love dear, thank you for passing the award to me. Will have to collect it soonest possible before I forget. As of now, I have 2 more pending homeworks to do. Gosh! Hubby in Cape Town? Why didn't you guys tag along? Cape Town is a lovely place to visit. Don't forget to visit the Table Mountain when you're there okay. hi love..wow best tu dapat kamera baru...terima kasih bagi award tu ya..
bila buat roti tu kasi mama juga ya..hihi..
that is a great gift from ur Hubby! And Congrats on ur award and thanks for sharing with me! Congrats dear for the award and thanks for sharing it with me..Wah bestnya dpt kamera from your beloved hubby, great gift indeed..
Hi again Love. Pecah rekod tau. I posted your award the same day I received it! Kagum pada diri sendiri nih. Hahaha... Anyway, I have something for you at my blog too. Tapi tak de paksaan okay. Do at your own freewill. Kotlah boring menunggu hubby tersayang balik, then you can just jawab the soalan periksa okay. Mel ~~> Owh really. That's good na. For me, camera is a must. I'm not happy with my Sony Satio, that's why opted for a digicam. Our dslr is too big to carry around, unless for vacations/functions and also to shoot food and my hubby's marine tank. That is a cool gift and congratulations on the award. So prefect gift, wat u need for ur food photography na:p..congrats on ur award and thanks for sharing dearie..
That is a lovely gift. I am having my name day tomorrow and my husband promised to buy me a new camera as well. Happy Birthday! Congrats on ur award n nice gift dear! jap..jap..hihih mesti nak pasang speaker kuat2 bila singgah sini..come to collect tthe lovely award..many thanks love! waahh baru sweet 31st yehhh...hepi belated birthday yeah! stays gorgeous as ever! wow!that's a lovely gift luv! how are you?? sehat ke?? Wow! Thatz a lovely gift..Congrats on your award..thanks for sharing it with me dear..you are really nice.. Thanks Love for the award & your thought for me. Wah, you have a lovely gift too, lucky you. Anyway, I've posted the eggless choc cake just now... happy baking! That's a lovely gift dear and congrats on your award...enjoy! dear love..hepi belated besday ya!! may everything that u wish 4 come true..GOD BLESS U!! akak jeles tgk hadiah baru yg love dapat tuh..hehee! hai loveeee..very sure ur on the bed right now..sweet dream dear...kmaz dtg nk amik award ni..tqvm..anyway hope blum trlambat lgi 2 wish u Happy Besday..smga gmbira slalu..muahhhh..lebiuuuu..
That's a cook birthday present! Tu as reçu un magnifique cadeau avec lequel tu vas pouvoir faire beaucoup de photos pour ton blog aussi. Merci pour le prix, je l'accepte avec plaisir. Wish u belated birthday day dear. Hope you had wonderful day and wonderful gift as well. Waiting to see all ur candid shots. By the way thanks for passing me the award. I should thank this blogosphere to get such a good and loving friends. Have wonderful weekend.. As here everyone are in holiday mood cos of thanksgiving. i missed this entry..ketapi dah tinggal..
guna compact senang kan utk ladies ni..congrats!! Thankyou for sharing the award with me...Happy Thanksgiving. Congrats on your birthday present! Without our camera in our "food blogging world" is like having a pen without the paper! He! He! Mine was a Panasonic Lumix DMC-FS6. Seems like hubbies of foodie bloggers does think alike when it comes to birthday presents! Thank you so much for sharing the lovely award with me! I have another homework not done too! Will collect next week! Thanks again!